The Qualitrol® T/Guard™ 408 is a multichannel fiber optic temperature monitoring system for power transformer hot spot measurements. It has been developed with long-term performance and stability in mind. This fiber-optic temperature monitoring system for power transformers offers accuracy, toughness and long-term resistance to failure. Coupled with the 408 system, the Qualitrol® T2 fiber-optic temperature probes provide accurate and direct temperature monitoring of transformer windings. This solution provides a realistic, real-time view of winding conditions that is quicker and more accurate than top oil thermocouple measurements, and greatly complements indirect measurements based on thermal models. 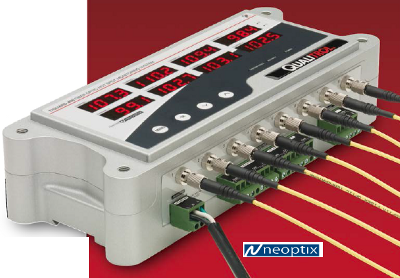 The Qualitrol® 408 gives the exact temperature of optical probes in 200 milliseconds per channel. 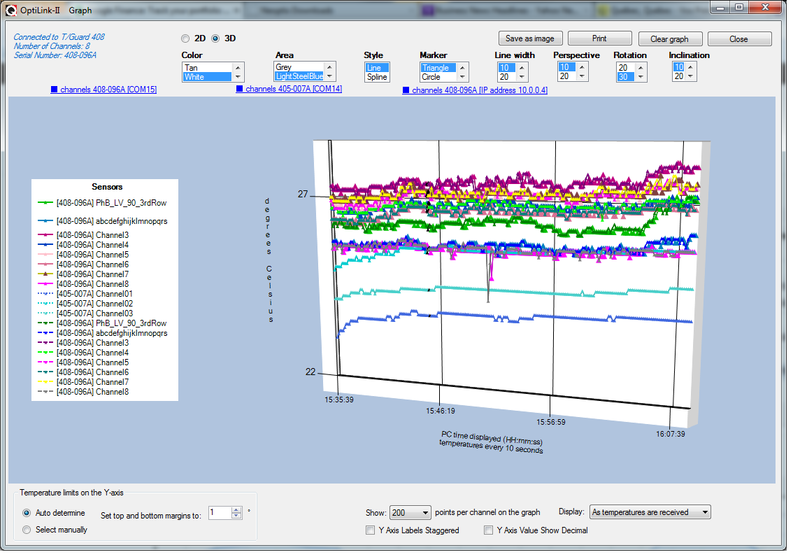 Peak load or emergency overloads are thus detected almost instantaneously. The 408 system is specifically designed to meet power transformer industry requirements: extended intervals between servicing, low maintenance, rugged components and the ability to withstand the harshest conditions. All components have been specifically selected for long term performance, including the light source that has an MTBF far superior (>300 years) to the expected life of the transformer. Moreover, compared to other technologies available on the market, such as fluorescent decay, our sensor, based on solid-state semiconductor, do not fade or drift over time, allowing a constant and absolute temperature measurement of your transformer windings over the lifespan of the equipment. Qualitrol fiber-optic probes are based on the proven GaAs technology and made only with dielectric materials. They are designed to withstand initial manufacturing conditions, including kerosene desorption and heat runs, as well as long term oil immersion and vibration. The 408 system is available with 4, 6, 8, 10, 12, 14 or 16 optical channels. There is one four-digit high powered LED display for each channel, allowing a clear view from a distance. 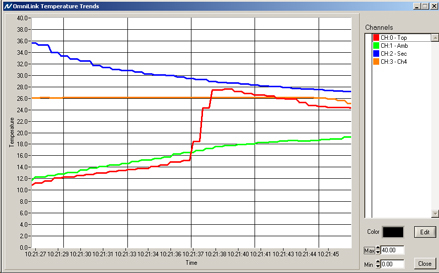 System's power consumption is 30 watts with all relays enabled. It accept a broad range of AC and DC inputs. The 408 can be mounted in the back of the cabinet or mounted directly on the cabinet swing door using the four bolts anchors. The 408 comes standard with a built-in 2GB (or optional 4GB) data logging memory that allows utilities and transformer operators to record temperature data points and alarm status information directly into their 408 temperature monitoring system, without the need for permanent connection to a remote acquisition system. This memory represents more than 35 years of data logging at every minute for a transformer instrumented with eight temperature probes. The information can be accessed through serial port (408) or any web browser (408XT). 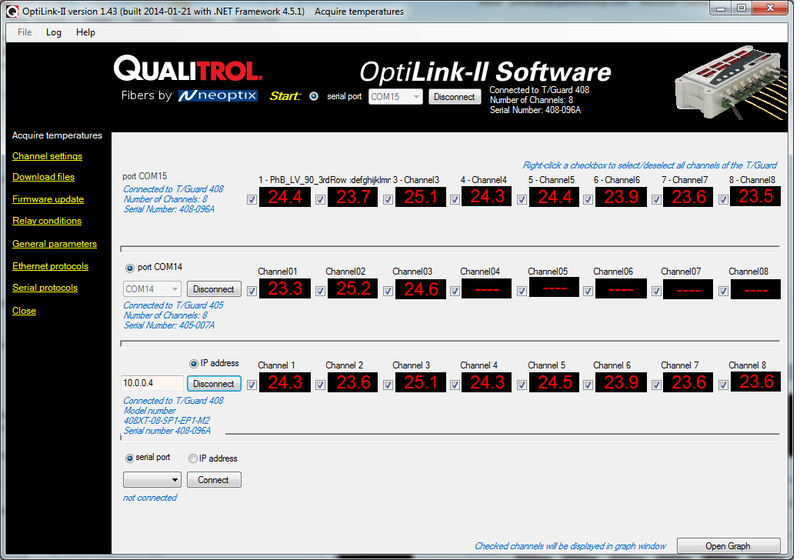 Moreover, data points are saved with a time stamp that comes from the internal real-time clock. The 408 T/Guard system is easy to interface to an existing marshalling or substation system through its 4-20 mA analog outputs or through its RS-485 serial port using MODBUS, DNP3 or IEC 80670-5-101 communication interfaces. The 408XT version is Ethernet / Smart Grid ready and incorporates, among others, IEC-61850 protocol. Information collected by the system can also be accessed through any web browser over TCP/IP. With its small footprint, the 408 is a space-efficient and versatile instrument. All connections are made through detacheable plugs for an easy and seamless installation or service. The 408 system has eight built-in Form-C (SPDT) industrial relays with galvanic isolation that can also be set up as Form-A or Form-B relays by user. The relays can be configured in fail safe mode whereby relays can be activated in case of system problem. One additional hardwired relay is a dedicated system fault relay. System's configuration is made through the industrial grade front panel keypad, serial terminal PC software or the built-in web-based server (408XT). 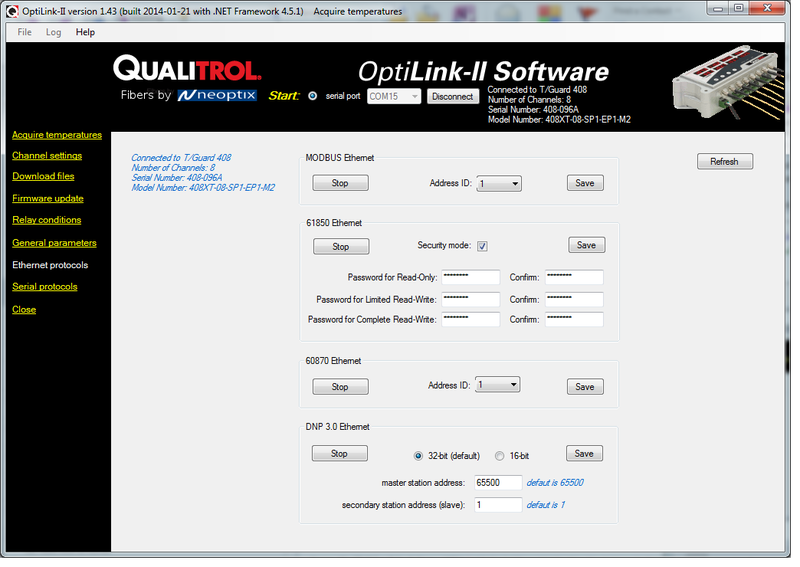 It is also fully compatible with Neoptix OptiLink software (via its serial port).